Adjusting to the weight of your new armour, you join your brothers in the feast hall. Tonight tales of bravery are shared, but tomorrow you and your Epic Dark Viking Armour will be tested before you are considered a true warrior. This Viking armour is a breastplate and backplate inspired by lamellar worn by the Vikings, protecting the front and back of the torso. Made from layers of mild steel plates connected with durable leather cording, this armour is flexible and impressive in detail. Strong leather lines the armour around the edges to add comfort, while adjustable leather straps along the sides and on the shoulders attach the front to a solid leather backplate. This steel piece has been treated with Epic Dark Metal coat for a rugged antique finish. The Epic Dark Viking Armour is fully usable with other Epic Armoury metal products, giving you the freedom to customize your kit. 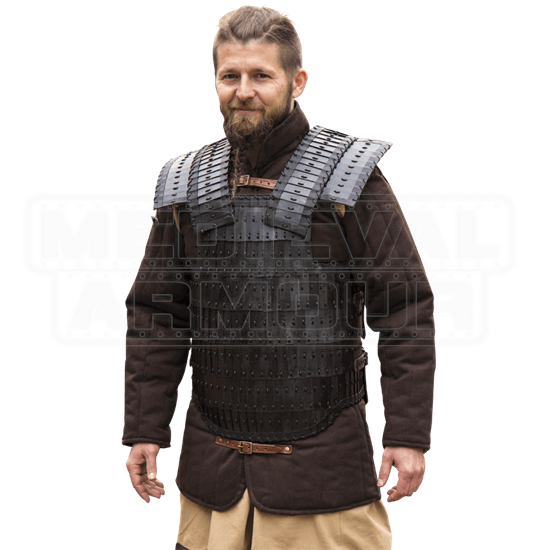 Made from 18 gauge mild steel and top-grain leather straps and fittings, this armour is built to withstand the abuse of a LARP or reenactment with regular leather and metal armour care.